Europe's no. 1 gluten free. Wheat free. Taste freshly baked rolls in 5 minutes! With sourdough for a light and easily digestible texture. Thaw for a soft roll or bake in the oven for a crusty texture. Lactose free (lactose <0.007g/100g). Preservative free. Source of fibre. Suitable for vegetarians. Specifically formulated for people intolerant to gluten. 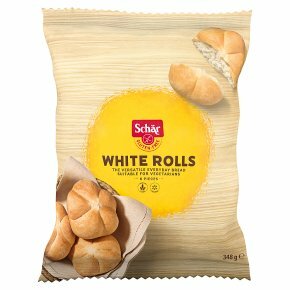 For soft rolls defrost 1-2 hoursFor crusty rolls preheat oven to 200ºC/180ºC (Fan) and bake for 8 minTip: To quicken the process, microwave on defrost for 1 min. and then cook in the preheated oven for 4 minutes.All cooking appliances vary in performance; these are guidelines only.